Tunis passenger and car ferry ticket prices, timetables, ticket reservations and information for ferries sailing from Tunis to Civitavecchia, Genoa, Marseille, Palermo, Salerno, Toulon and Trapani. Compare all available Tunis ferry ticket prices in real time and book the cheapest available Tunis car and passenger ferry tickets sailing to and from Tunis, Civitavecchia, Genoa, Marseille, Palermo, Salerno, Toulon and Trapani with Grandi Navi Veloce, Grimaldi Lines, CTN Ferries or SNCM Line ferries online with instant confirmation. Book Tunis Ferry Tickets with Grandi Navi Veloce, Grimaldi Lines, CTN Ferries or SNCM Line for ferries sailing from Tunis to Civitavecchia, Genoa, Marseille, Palermo, Salerno, Toulon and Trapani online in advance to enjoy the cheapest available ferry ticket price. The price you see is the price you pay. There are no hidden extras or surprises such as added fuel surcharges or booking fees and we do not charge you anything extra for paying with a Visa Electron card. The price we quote you for your selected Tunis passenger or car ferry ticket, onboard accommodation and vehicle type is all you will pay, and that's a promise. To obtain a Tunis ferry ticket price and book your ferry ticket securely online please use the real time ferry booking form on the left. You are also able to add a hotel at your destination, or anywhere else, to your ferry ticket when completing your ferry ticket reservation. Tunis is a vibrant yet laid-back capital city, equally happy looking to Mediterranean traditions as its Arab and African roots. It's an attitude reflected in its architecture, with the old Arab medina sat next to the French colonial Ville Nouvelle (New Town). The medina is Tunis’s historic and spiritual heart. A winding maze of alleys and souks, all paths seem to lead to the 8th-century Zeytouna Mosque, built in AD732. The contrast with the palm trees and café terraces of the ville nouvelle's avenue Habib Bourguiba could not be greater. Old men in traditional dress watch suited office workers and the young go past in jeans and shirts, this is Tunis. In the suburbs are the impressive ruins of the ancient city of Carthage, from where Hannibal set forth to drive his elephants over the Alps. Also nearby is Tunisia's most beautiful village, Sidi Bou Said, inspiration to many artists, and the gorgeous white-sand beaches of La Marsa. Several ferries connect Tunis with Europe, a good option if you want to bring in your car. The SNCM ferry does two weekly crossings from Marseille in the south of France to Tunis, while Grandi Navi Veloce operates regular ferries from Civitavecchia, Palermo and Genoa in Italy. Reservations are essential, particularly in summer. The ferries to Tunis arrive in the port of La Goulette, 12km (7 miles) from the city centre. Only use the official yellow metered taxis waiting outside the port, the private taxis waiting inside the port often overcharge. This is the main tourist office in Tunis. It is located in the New Town near the train station Tunis Maritime. The staff is helpful but there are few useful handouts, except for a free city map, and an excellent map of the medina with a suggested walking tour. They offer information on public transport and travel in the rest of the country. There is another tourist office with slightly more brochures and handouts at the railway station (place de Barcelone). The medina grew around Tunis's largest mosque, Al-Zaytuna Mosque (Mosque of the Olive Tree), covering over 5,000 sq m (53,820 sq ft) and the only one open to non-Muslims – although only as far as the central courtyard. One of the oldest mosques in Africa, it was built in AD732, often using stones from nearby Roman Carthage, but it flourished from the 13th century onwards as an important Islamic university. Tunis’s main thoroughfare is the elegant and wide tree-lined avenue Habib Bourguiba, which runs from the TGM train station to the main entrance to the medina. Lined with banks, shops, restaurants and café terraces where Tunisians converge in the late afternoon, it also boasts the grand art nouveau Municipal Theatre and the 19th-century Cathédrale de St Vincent de Paul. A statue of the great medieval Arab (and Tunisian) scholar Ibn Khaldun stands opposite the cathedral, while modern Tunisia is represented by the huge clock tower built to commemorate the presidency of Ben Ali. One of the best-preserved medina palaces in Tunis, the impressive late 18th-century house of Dar Ben Abdallah has a rich collection of furniture, textiles and crafts, giving a fascinating glimpse into what 19th-century life was like in the medina for the wealthy. Housing the Museum of Popular Arts and Traditions, it's a great place to see the finest examples of traditional arts and crafts – you can still see much of the same handiwork being produced in the medina. Built in the 13th century, and recently extensively renovated and reorganised, this splendid palace is now not only an outstanding example of Arab-Muslim architecture, but it also houses Tunisia's national museum. The main reason to come here is to see the astounding array of Roman mosaics, the largest and finest single collection in the world, dating from the second century BC to the seventh century AD. The Greek and Islamic holdings are also excellent. Arrive either early or later in the day to miss the massed tour groups. This splendid 18th-century Ottoman mausoleum, the largest in Tunis, is where more than 160 Husaynid princes, ministers and their families are buried. The sumptuous interior is decorated with tiles, marble and carved plasterwork. The motif of the eight-pointed star represents the doors of paradise. A UNESCO World Heritage site, the medina, or old quarter, of Tunis was built during the seventh century AD. From the 12th to the 16th centuries, Tunis was considered to be one of the greatest and wealthiest cities of the Islamic world and its medina is testimony to its former grandeur. Today, visitors can step back in time through the maze of narrow, winding streets, and barter for souvenirs with the locals; goods on sale include colourful hand-made carpets, hand-crafted jewellery, copper and brassware, pottery and exotic spices. The endlessly twisting streets can be disorientating, but it's as much fun to give yourself over to random exploration and the happy accidents of discovering traditional craftsmen, food markets and ancient monuments. Among the more frequented attractions found within the walls of the medina are the ninth-century Al-Zaytuna Mosque (Mosque of the Olive Tree), the perfume makers' Souk el Attarine and Tunis's first Ottoman-style mosque, Sidi Yousef, built in the 17th century. Best Price Guarantee - We always offer you our lowest available Grandi Navi Veloce, Grimaldi Lines, CTN Ferries or SNCM Line passenger and car ferries ticket price to and from Tunis. There are no hidden extras or surprises such as added fuel surcharges or booking fees and we also we do not charge you anything extra for paying with a Visa Electron card. The price we quote for your selected Tunis ferry ticket, onboard accommodation and vehicle type is all you will pay, and that's a promise! In the unlikely event you find the same all inclusive Tunis ferry ticket cheaper in the brochure of any other tour operator we promise that we will do our best to beat that price or offer you the choice of requesting a refund. 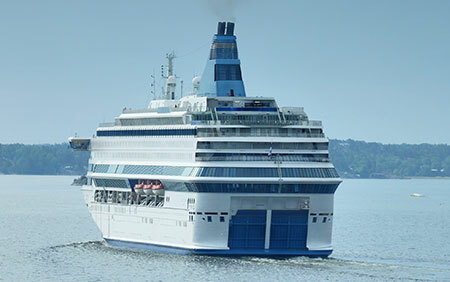 To book Tunis car and passenger ferry tickets please click here. At ferryto.co.uk you are able to obtain live Tunis ferry ticket prices, check availability and book car and passenger ferry tickets to and from Tunis at our lowest available ticket price. Ferryto.co.uk is part of the world's largest online ferry ticket distribution network providing the ability to book over 80 major European ferry operators including to Tunis and to over 1,200 other ferry routes throughout the UK, France, Spain, Ireland, Holland, Eastern Europe, the Mediterranean, the Baltic and North Africa.